This worm can be found in sandy/rocky beaches hiding beneath the sand and can be found in clusters especially near rocks. You often see people luring the worms out using bread wrapped with a soaked cloth and dripping it over beach surface near the water. This will cause the worms to surface with only its head exposed. Use your fingers or a pair of pincers to grab the worm's head and pull it out swiftly. 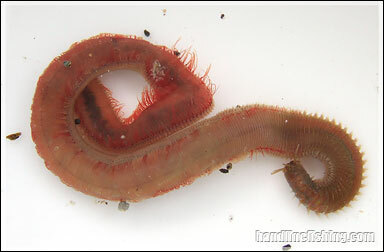 The size and shape of the rag worm is much like that of the tube worm which makes it just as viable as bait for fishing. They're a little less commonly sold in tackle shops compared to the Sarong worms. However, they're easier and faster to catch compared to Sarong worms.